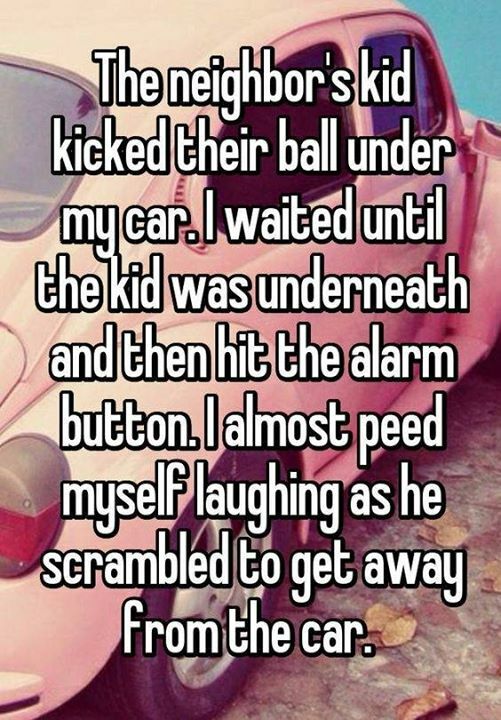 THE NEIGHBORS KID KICKED THE BALL UNDER MY CAR. I WAITED UN - ProudMummy.com the Web's Community for Mums. THE NEIGHBOR'S KID KICKED THE BALL UNDER MY CAR. I WAITED UNTIL THE KID WAS UNDERNEATH AND THEN HIT THE ALARM BUTTON. I ALMOST PEED MYSELF LAUGHING AS HE SCRAMBLED TO GET AWAY FROM THE CAR.